With the brand new W222 Mercedes S-class less than 12 months away, development of the upcoming flagship Mercedes is in its final stages - testing in the UK. 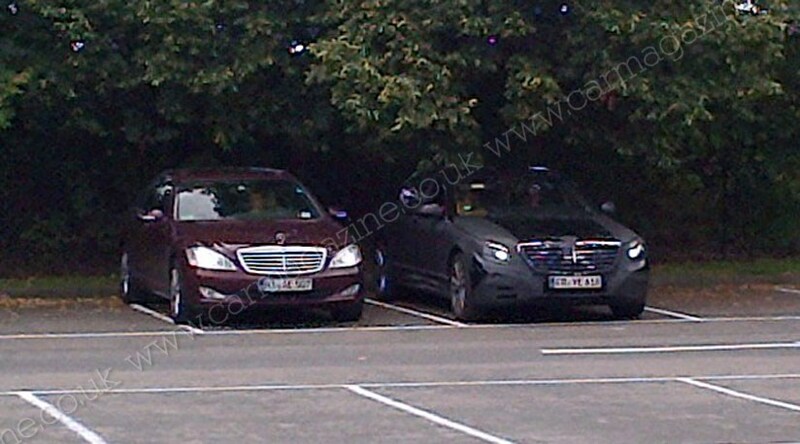 A disguised test mule has been spotted again, this time by CAR reader Kshitij Malkan, who caught the new car testing alongside the best-selling current model in Norman Park, Bromley. The tell-tale disguise, German plates and left-hand drive configuration show this is clearly a test hack doing big miles. Our other shots show the car hot weather-testing in Death Valley earlier this summer. No, that's not a misprint - the new Mercedes S-class will spawn seven separate versions, fighting executive saloons at one end of the market, and high-performance Bentleys and Rolls-Royces at the other. The new S-class is in effect replacing the Maybach, Mercedes' briefly resurrected super-luxury offshoot which has been quietly killed off owing to disastrous sales. In its place, Mercedes will offer a super-long wheelbase S-class, and a six-door Pullman version, with 350mm and 650mm of wheelbase stretch respectively. These cars will sit above the standard 5100mm wheelbase S-class and the LWB one with 180mm of extra length. That's four S-classes, all of different lengths - what's next? Then we've got the sporty ones. The current CL will be replaced by another full-size coupe, and there'll be a CL convertible for the first time too, akin to the 2006 Ocean Drive concept. Finishing off the seven-model S-class range is a four-door coupe version, essentially a bigger brother to the genre-defining CLS. And you thought Audi was king of the niches! All models will of course be tech-heavy: 'Magic Ride Control' will monitor the road ahead and adjust damper settings accordingly, and a more advanced system of radar-guided cruise control will even execute motorway lane changes on the driver's behalf, while monitoring blind spots and speed limits. Makes you wonder what the driver's actually for, really. For more in-depth explanation of the new S-class' gadgets, please click here. And powering the new Mercedes S-class fleet? This generation of S-class will feature the widest range of powerplant and drivetrain choices yet seen. The new S-class still launches with the familiar V6 units, but it'll be the last hurrah before more frugal straight-six units take over in 2017. The initial engine line-up should span from the S250 CDI 224bhp turbodiesel to the mighty petrol V12 fitted to the S600 and the S65 AMG. Ultimate CL versions will boast around 680bhp from their updated bi-turbo V12s. Why you'd ever need Lamborghini Aventador power in a luxury saloon-based cruiser is beyond us, but the Germans do seem to have nailed the more power/less consumption recipe. The final metamorphosis of the outgoing V6 is a petrol-fed 3.0-litre good for 333bhp. On the hybrid front, customers will be able to choose from three options: ranging from an entry-level S equipped with a 41bhp electric motor to plug-in versions with 61bhp and 109bhp extra. Any more Mercedes S-class news? Although Mercedes isn't a big user of carbonfibre, the new S63 will use the lightweight weave for boot, bonnet, door and roof panels to lower the centre of gravity and fight the flab. A completely redesigned cabin is also hotly awaited - but CAR's already scooped the undisguised interior last month, so please follow this link for more details.